I’ve been after this one for a while now and today my good old pal Howard was tipping at the same place as this little MAN wagon and drag. Many moons ago I tried to get reloads from Middlewich Food Trays but I was told that I needed a trailer to make it worth while. Anyway that was another reload out the window but I always kept an eye out for the little wagon and drags as they went about their business delivery the core of the UK’s take away industry all over the UK. 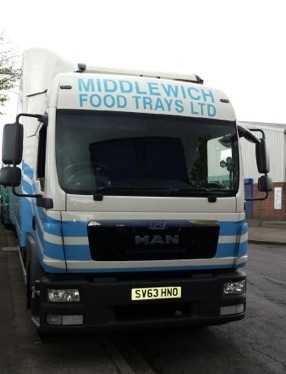 These days Middlewich Food Trays are still operating mini drawbar outfits as their loads of polystyrene cube out way before they reach their maximum payload. This LX cabbed TGL is an 8.220, it is also the newest on the fleet. The extra power comes in handy when pulling the drag trailers, by name they can be a real drag. The body on the truck is also mounted 18 inches further back than normal to help try and stabilise the outfit when towing the trailer. The only thing they should also have specced is a sun visor, it just looks wrong, well in my opinion anyway. 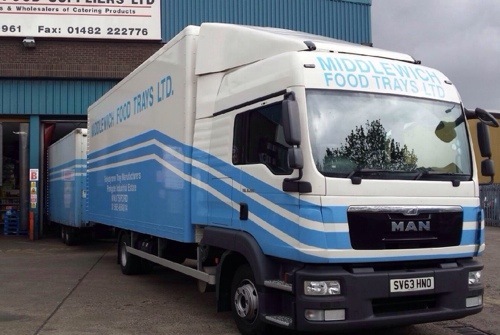 Still a good looking little thing so if you see any more Middlewich trucks then please send me a photo. You can email me; ben@truckblog.co.uk or you can post it on the TB Facebook page or you can even Tweet it; @truckbloguk I’ll happily start a spotting thread for this little fleet. Thanks to Howard and also Shaun who sent a photo of a rear view of a MFT truck a few months back. This entry was posted in Drivers Photos, MAN, Mini Artics by truckbloguk. Bookmark the permalink.